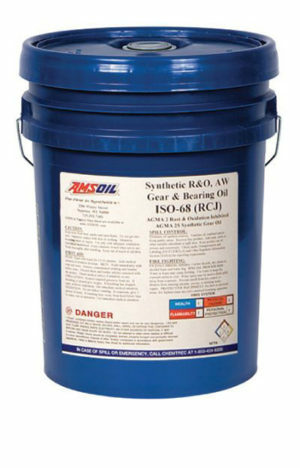 AMSOIL Synthetic RC Series R&O/AW Gear and Bearing Oils are formulated with high-quality synthetic base stocks and additive systems that effectively prevent wear and protect equipment by maintaining viscosity, resisting thermal and oxidative breakdown, preventing rust and resisting the degrading effects of water. AMSOIL RC Series Oils are very shear-stable and oxidation-resistant, preventing viscosity loss from mechanical shear and viscosity increase from oxidation. RC Series Oils remain fluid at cold temperatures, providing easier startups, quick lubrication circulation and limiting the need for sump heaters. At higher temperatures, RC Series Oils maintain a thick lubricating film, reducing metal-to-metal contact and component wear. AMSOIL RC Series Oils are formulated with complete additive technology to enhance performance. Nondetergent, ashless antiwear additives provide an additional layer of protection against wear in severe conditions, rust inhibitors protect critical components against corrosion in the presence of water or process contaminants, antioxidants increase oxidation resistance and extend lubricant life and foam suppressants prevent foaming and air entrapment. RC Series Oils provide hydrolytic stability (stability in the presence of water) and demulsibility (ability to separate from water), increasing lubricant life, preventing oil/water emulsions and allowing reservoirs to be drained of water. AMSOIL Synthetic RC Series Oils are primarily recommended for gear and bearing applications and circulating systems requiring R&O and/or antiwear additive technology. RCE is a clear, nonstaining oil with an ISO-10 viscosity designed for high-speed spindles such as those found in textile applications. The lighter viscosity RC Series Oils (RCF-RCH) provide superior protection in high- and low-pressure gear, vane and piston hydraulic systems, compressors, high-speed bearings, small gear sets, pumps, high-speed spindles, high-speed gears and many other industrial applications. Higher viscosity RC Series Oils, beginning with RCI (ISO 46), meet AGMA specifications for R&O and Synthetic gear oil specifications 1 through 8, respectively, for the lubrication of intermediate-speed equipment where mild shock loading and intermittent service are involved. These applications include machine tools, roller chains, gear reducers, cone drives, large motor bearings, medium-speed ball and roller bearings, blowers and worm gear sets. Consult the manufacturer for proper viscosity recommendations. The ability of RC Series Oils to extend drain intervals is subject to operating conditions and maintenance practices and should be monitored by oil analysis. Note: AMSOIL RC Series Oils are not designed for applications requiring Extreme Pressure (EP) agents. For EP fortified lubricants, refer to AMSOIL SG Series Gear Oils.